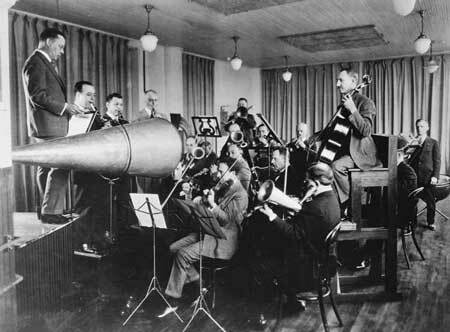 The period 1917 through 1919 was a transition for Stokowski and the Philadelphia Orchestra as to their adaptation of acoustic recording techniques to the symphony orchestra. According to the Victor ledgers, the orchestra in 1917 had been recording with a nearly full orchestral complement of 93 musicians during 1917 6. However, only 5 of the sides recorded by the Philadelphia Orchestra in 1917 were approved for release by Stokowski. By the time of the 1919 recordings, Victor engineers had decided to reduce the recording complement to typically 46 players, approximately half the musician complement of the 1917 recordings. There were now typically 10 violins, rather than 31, 4 violas instead of 12, 4 celli instead of 10, and 4 string basses, rather than 8. This reduction was apparently not for economic reasons, unlike the reduction of orchestra players which would be imposed during the economic depression of the 1930s, which was to save money. Rather, the reduced orchestra of the acoustic era was said to be for improved "clarity" in the recorded result. It was also physically difficult to place the musicians of a full orchestra in physical proximity to the recording horn. In 1917, the orchestra musicians were placed by Victor in domes looking somewhat like igloos, with openings directing the music toward the recording horns. Also, beginning in 1919, Stokowski and Victor began supplementing or even replacing instruments of the orchestra to improve the reproduction of low and high frequencies. String basses, which failed to record effectively, began to be supplemented or even completely replaced by tubas and bass Saxophones. The acoustic process did not reproduce much acoustic energy below 200 Hz. String basses typically play in the range of 40 Hz to 200 Hz, so they recorded faintly, or perhaps not at all. Furthermore, what bass was captured caused larger excursions of the stylus, and could disrupt the delicate cutting stylus inscribing the wax master. In 1919, we can hear tubas augmenting the string basses, for example in the 9 May 1919 recording of the Weber - Invitation to the Dance. Similarly, during the acoustic era, timpani were frequently replaced entirely by contra-bassoons, and other percussion instruments were often avoided. The rapid onset of the percussion sound energy could cause the stylus to skip off the wax master. For example, the 8 November 1917 recording of the Scherzo from a Midsummer's Night Dream for example used a contrabassoon, not in the score, rather than a timpani. As well as the reproduction of the frequencies, the sudden sound transients of percussion were carefully avoided. Further, in the higher frequency range above about 2,400 Hz, the acoustic process reproduced only very faintly, if at all. The meant that the harmonic overtones of the higher instruments were not reproduced. As a result, violins, flutes and clarinets tended to sound the same. For this reason, violins when they were high in their range to about 3,100 Hz were supplemented by flutes and piccolos, which produced more sound energy at these higher frequencies. Also, as shown in the photograph below, Stroh violins, fitted with horns to project the violin sound toward the recording horn were also used. Victor Orchestra as it looked for acoustic recording with Stroh violins and cello on a riser. These changes must have been particularly unsatisfying for Stokowski, since one of the basic characteristics of Stokowski's orchestral balance, at least as we know it from later years, was a sold base coming from the string basses and low brass. This lower bass resonance, rising up though the celli and then through the rest of the orchestra was one of the fundamental Stokowski building blocks of his orchestral sonority, which could not be replaced by tubas or contrabassoons. On a related subject, read about Stokowski's use of orchestra seating to gain sound clarity, including projection of the string bass sound by clicking on the link Stokowski Innovations in Orchestral Seating. One aspect of the acoustic process which was relatively favorable was the dynamic range, which sometimes reached 40 db. This was in spite of the presence of the "frying egg" noise resulting from the surface of the shellac of the disc, which was mixed with an abrasive. The rough surface of the disk reduced the signal-to-noise ratio of the recording. However, since the process was mechanical, transients were captured. In fact, transients could not be controlled in the mechanical acoustic system except by limiting the performers, by distance, or by their performance volume. The effective recorded range of the acoustic process was therefore reduced to a range of about the E or F below middle C, or about 190 Hz to about three octaves above middle C, which is about 2,100 Hz 2. Within this range, Stokowski and the Philadelphians learned to capture what they could with the equipment, the instrumentation, and the musical arrangements with which they were constantly experimenting. This transition of the orchestra as recorded from 1917 to 1919 can be witnessed by three recordings from this period by Mendelssohn, Gluck and Grieg. First is the Scherzo movement from Mendelssohn's Midsummer's Night Dream. Following Stokowski's first recording sessions of on 24 October 1917, two weeks later, on 6 and 8 November 1917, Stokowski and the Philadelphia Orchestra returned to Camden to record short, popular movements of works by Mendelssohn, Gluck and Grieg. The incidental music for A Midsummer's Night Dream was written by Mendelssohn in 1842 when he was 33. The Scherzo is one of several famous movements from the incidental music and the recording of 8 November 1917 featured a full complement of 86 musicians, (16 first violins, 15 second violins, 12 violas, 10 celli, 8 double basses, 1 harp, 3 flutes, 2 oboes, 1 English horn, 3 clarinets, 2 bassoons, 1 contrabassoon, 4 horns, 2 trumpets, 1 tuba, and 1 percussion). Another famous movement, the "Wedding March", Stokowski and the Philadelphians attempted to record in March, 1923, but this recording was not authorized for release 5. The Scherzo from A Midsummer's Night Dream was issued on a Victor 12 inch (30 cm) Red Seal disc 74560, matrix C-21056-4 which was released by Victor in February 1918. This Mendelssohn Scherzo, as well as the Grieg Anitra's Dance, and the Gluck Dance of the Blessed Spirits were all recorded with a full orchestral complement of 86 musicians. Contrast these 1917 recordings with the sound with the Weber Invitation to the Dance, or the Strauss Blue Danube Waltz recordings of 1919 (listed below) which were recorded a much smaller 46 musician orchestra. At the November 8, 1917 Camden recording session, Stokowski next recorded the "Danse of the Blessed Spirits", or "la Ronde des esprits bienheureux" in its original title. This music comes from Christoph Willibald Gluck's opera "Orfeo ed Euridice", originally composed in 1761-1762 when Gluck was living in Vienna. Later, in 1774, the French version. "Orphée et Eurydice" was expanded for the Paris Opera, with ballet music added, as was the Paris fashion of the time. The ballet which begins Act 2 scene 2 includes the music of "The Dance of the Blessed Spirits - Ronde des esprits bienheureux". This recording has a nostalgic flavor of a salon orchestra performance, and shows that the Philadelphia Orchestra strings were already of the first rank. The music also includes a sadly beautiful and soaring flute solo, presumably performed by Daniel Maquarre, solo flute of the orchestra 1910-1918. 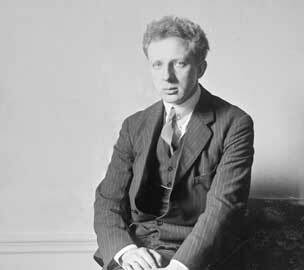 In 1918, Daniel Maquarre moved to the New York Symphony. Daniel was then succeeded by his older brother André Maquarre, previously solo flute of the Boston Symphony, who became Principal flute of the Philadelphia Orchestra for three seasons, 1918-1921. The "Danse of the Blessed Spirits" was issued in July, 1918 on a single faced Victor Red Seal 12 inch disk 74567, matrix number C-21066-1. At the November 8, 1917 recording session, Anitra's Dance from the Peer Gynt Suite, opus 23 was also recorded with a full orchestra of 86 musicians. Ibsen had asked Grieg to compose incidental music for Ibsen's play "Peer Gynt", which was performed with Grieg's music in 1876. The original incidental music for the play the makes use of solo voices, chorus and orchestra. However, Grieg arranged his music into two orchestral suites. These suites include many famous movements, often performed and often recorded, such as "Morning", "Aase's Death", "Anitra's Dance" and "In the Hall of the Mountain King". Anitra's Dance was the third recording from this session occurred on 8 November 1917 in the eighth floor Auditorium of the Victor executive office building (Building no 2). It was issued on a 10 inch (25 cm) single faced Victor Red Seal disk 64768, matrix number B-21067-2. Two great composers with whom Stokowski seems to have had little affinity were Mozart and Bruckner. This 1919 recording of a movement of Mozart’s Symphony no. 40 is the only surviving example of Stokowski in a commercial recording of a Mozart symphony known to us so far, with the exception of a New York Philharmonic performance of the Haffner recorded by Columbia in 1949, but apparently never commercially released by them. Nearly all the Mozart from Stokowski’s legacy is from live performances, other than the Philadelphia Orchestra recording of the Sinfonia Concertante with the first chair soloists of the Philadelphia Orchestra at the very end of Stokowski's Philadelphia tenure in 1940, and the German Dances KV 509, number 3 in a Victor recording of March 2, 1949 with 'His Symphony Orchestra'. Haydn was featured in Stokowski's Cincinnati and Philadelphia concerts somewhat more than Mozart, according to Robert Stumpf's excellent concert registry 8. Stokowski seems to have performed several late Haydn symphonies once, or with some works, twice. He also performed the Haydn Symphony no 45 in 1926. The Haydn Symphony no 88 he regularly performed. Regarding Bruckner, in an interview, which I remember, but cannot locate, Stokowski mentions that Bruckner is a composer whom he recognizes as great, but whom he cannot appreciate (he qualified it as being "up to now"). Stokowski did in fact conduct Bruckner twice. He programmed the Symphony no 4 with the Philadelphia Orchestra on 20 and 31 October 20 1914. Perhaps Stokowski was trying it out to determine his assessment of Bruckner. Playing Bruckner's music with his orchestra may have been his only means to find out, since live performances of Bruckner then, and for the next 40 years would be rare, and the first Bruckner recordings listed by Arnold 7 were not made until 1924. His second, and apparently last ever Bruckner performance was of the massive and soaringly majestic Symphony no 7 in 1925. Have a look at the program for that concert3, which is unlike what most other conductors of then (or now) would construct. What a mix! It would seem that Stokowski concluded that Bruckner was, as he said, a "closed book" for him. This would seem to me surprising, given the sonority, the building of ever-growing structures of noble sound, and the glorious emotional heights of Bruckner. These characteristics would seem to me more likely congenial to Stokowski's art than, for example Mahler (a few of whose works Stokowski conducted throughout his career). However, after 1925, no Bruckner performance is listed in the concert registries I have seen covering the next 50 years of Stokowski's music making. Later performances of Mozart were also remarkably few, given the popularity of this great composer, although not so few as Bruckner, whose music Stokowski seems not to have performed at all after 1925. All of these recordings were done in the newly refurbished Camden Church Studio building in Camden, New Jersey. 1919-1924 Stokowski Wagner Acoustic Recordings. 1919-1924 Stokowski Russian Acoustic Recordings. The other 1919 recordings are described below, beginning with the Mozart Symphony no 40. One of the approved recordings from Friday, May 9, 1919 was of a symphonic movement from one of Mozart's greatest symphonies. This was, incidentally, the last Mozart recorded by Stokowski as music director of the Philadelphia orchestra, excepting only the Mozart Sinfonia concertante in E flat, one of the very last recordings Stokowski made with the Philadelphian Orchestra as its permanent conductor. This Sinfonia concertante recording was made in December, 1940, more than 20 years following this acoustic Symphony no 40, K550, Minuetto movement. Stokowski and the Philadelphia Orchestra's performance of this movement from Mozart's Symphony no 40 seems to me somewhat stiff and lacking in flexible grace. However, it would have been a satisfactory experience for listeners in that far-off era who wanted to be able to experience this great music whenever they wished to do so, and had few other choices. Also, the playing of the Philadelphia Orchestra is fully satisfying. Contrast their playing with the recording of the Mozart Symphony no 39 made by the scholar and composer Eduard Künneke with the 'Large Odeon String Orchestra'. This is a complete (although cut) recording of the Symphony on six Odeon disk sides in October, 1913. The Odeon house orchestra, like its Victor counterpart of the same period, the Victor Concert Orchestra, would likely have been made up of leading musicians, in this case of Germany. However, although Künneke's performance is reasonably lively, the scrappy orchestral performance would seem today to compare to a local amateur orchestra at best. This again reminds us of the lack of precision and ensemble of orchestral playing of this era, to the extent that we may evaluate it from surviving sources. Contrast this scrappy performance from Berlin with the polished playing of the Philadelphians which Stokowski had obtained by 1919. It is striking. One of the interesting impressions from the past is that the orchestral playing of even famous orchestras, including well-known European groups from the 1920s and 1930s could be remarkably poor, as we can hear from the surviving 78 RPM recordings of the era. In both ensemble and precision of playing, there is often a lack of virtuosity that is striking to our ears today, so used to the great orchestras filled with the gifted graduates of the world-famous conservatories. In this 1913 Odeon recording, listen to the use of what sounds like true timpani in the early Künneke performance, compared with what sounds like a contra-bassoon in the Philadelphia Orchestra recording. To me, this is an interesting comparison, which you can hear by clicking on the link below. Later that Friday, May 9, 1919, and the next day, Saturday 10 May 1919, Stokowski and the Philadelphians recorded two works that we would now refer to as being "pops". First was Felix Weingartner's orchestration of the Karl Maria von Weber piano work "Invitation to the Dance" (Aufforderung zum Tanz), opus 65, recorded 9 May 1919. Unlike the 1917 sessions, this recording was done with a greatly reduced orchestra of 46 players 6, with bass parts reinforced by a bass Saxophone, contra-bassoon, and tuba. The second take of four takes done on that Friday recording session was issued on Victor Red Seal 12 inch disk 74598, Matrix C-22821-2. 1919 Recording of Johann Strauss "On the beautiful Blue Danube"
After unsuccessful attempts to record this Strauss waltz on 7 and 8 April 1919, on Saturday May 10, 1919, Stokowski and the Philadelphia Orchestra succeeded in recording what was the first of a number of best-selling Johann Strauss recordings made by them over the next two decades. This was 'On the beautiful Blue Danube' ('An der schönen blauen Donau'), by Johann Strauss the Younger. This was issued as Victor 74627, a 12 inch single sided Red Seal disk, matrix number C-22825-4, indicating this was take number 4 of that day. Of course, both the Weber and the Strauss selections were heavily cut to fit, each, onto one 12 inch (30 cm) 78 RPM side. 1 page 80. Aldridge, Benjamin. L. The Victor Talking Machine Company (edited by Frederic Bayh) RCA Sales Corporation. June, 1964. 3 Year 1925 listing from Robert M. Stumpf II Concert Registry: see footnote 8, below. 4 Sooy, Raymond. Memoirs of my Recording and Traveling Experiences for the Victor Talking Machine Company. Manuscript, not dated, but ending with events of 1931. An important contribution to the history of recording, the David Sarnoff Library edited and reproduced these memoires on their website. 5 See the excellent Stokowski Discography, including his acoustic disks by Enno Riekena. Mr. Riekena, a Stokowski expert and scholar has carefully prepared and researched this discography, including correct names of the works recorded, which may often vary from the title selected by Stokowski or by Victor for the record label. Mr. Riekena's discography includes information on the acoustic recording sessions attempted from which no recording was released. 6 Victor Talking Machine ledgers as reported by the The Encyclopedic Discography of Victor Recordings (EDVR) University of California, Santa Barbara. 7 Arnold, Claude Graveley, C.S.B. The Orchestra on Record, 1896 - 1926, An Encyclopedia of Orchestral Recordings Made by the Acoustical Process. Discographies, Number 73, Greenwood Press, Westport Connecticut. 1997. ISBN 0-313-30099-2.